It's hard to beat this "Limited Edition" BULLET ENGINES 632 engine for all out power, tree stump pulling torque and total reliability. Up to 780 dyno-tested horsepower on pump gas and everything covered by a 2-year, 24,000 mile limited warranty. 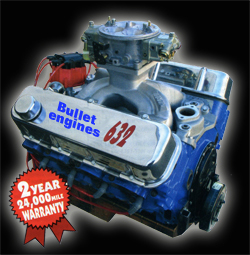 Reliability is clearly one of the important features of the hot "Limited Edition" engines from BULLET ENGINES. Each engine is individually dyno-tested and certified to meet or exceed published performance data.